Mall of America shoppers in Bloomington, MN, don’t need to shop till they drop anymore. 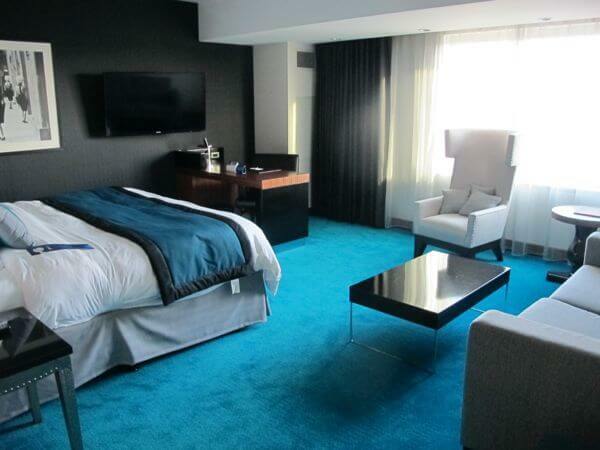 Now they simply can stretch out in a bed (room) at the upscale Radisson Blu Mall of America Hotel. 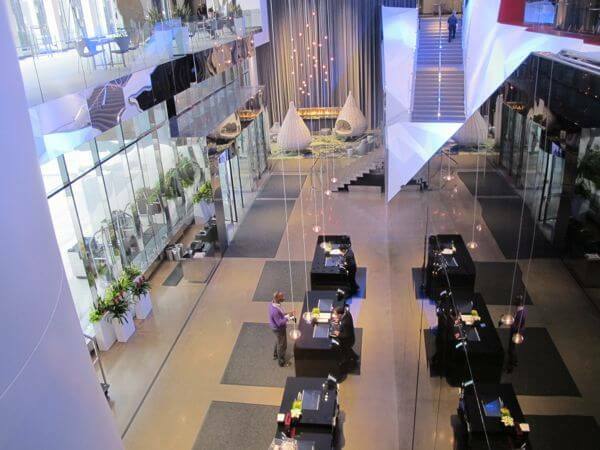 Opened in March 2013, the hotel is the first and only hotel to connect directly via Skyway to the Mall of America. The Skyway hallway that connects the Radisson Blu to the Mall of America. 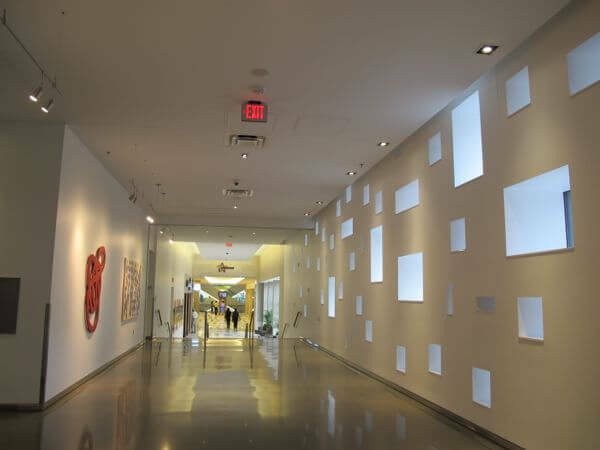 The various shaped windows were designed to represent snowflakes. 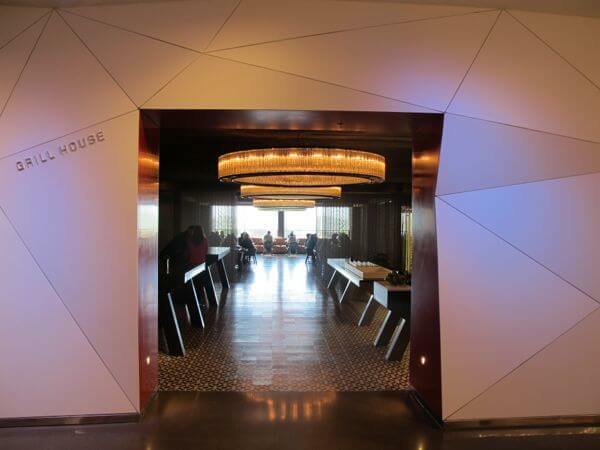 Part of the Carlson Rezidor Hotel Group (a Minnesota-based company that owns Radisson brand among others), the Radisson Blu concept takes the old Radisson up several notches and into the upscale hotel echelon– and the spectacular check-in lobby is only the first indication. With 13 floors, the hotel has 500 rooms—divided into three different décor type styles: the traditional Urban room, the Mansion (carpeted and “clubby”) room and the Naturally Cool (wood flooring, pale neutrals) room. For me, an upgrade from an Urban Room to Business Class at check-in meant I could choose from the last two styles –and also gave me access to the hospitality “Lounge” which added a complimentary breakfast and evening cocktail reception. For style, I chose the Mansion room—and I loved it. The spacious room included a nice sitting area with small sofa and coffee table plus another upholstered chair, a desk area with loads of strategic plug-ins for all your tech gear (I totally appreciated the ones near the bedstand for hooking up your iphone at night –instead of crawling on the floor somewhere). Other perks included free wi-fi, bathrobe, turn down service, Nespresso machine, even use of an IPad for the length of your stay if desired. While I don’t think the room was designed simply for shoppers in mind, I found a few of my favorite features seemed related to their comfort and fashionista mindset. For example: the extra deep European style bathtub (there is a separate rain shower) with complimentary bath salts—for soaking those sore foot and leg muscles (don’t think pounding the shopping mall aisles is not a workout). Or the black-and-white poster artwork of models on a runway. 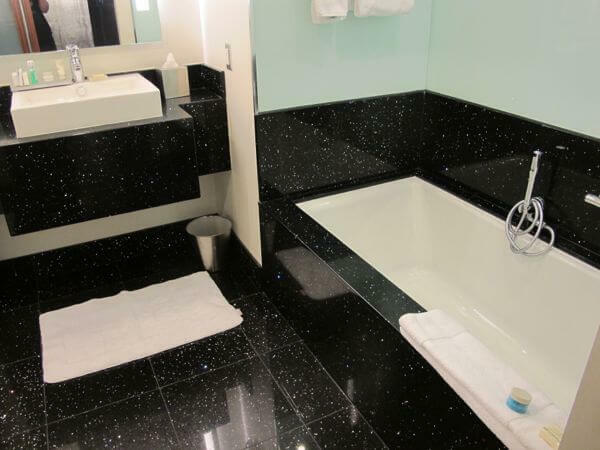 My favorite of all though: the black tiled floor studded with sparkling “diamonds” in the entry area of the Mansion room—it just begged to be used for a mini-fashion show event for girlfriends on a shopping getaway. I didn’t need to take advantage of it, but another perk the hotel provides MOA shoppers is the option of putting a call into the desk for someone to pick up purchases in the mall (i.e. say you have a bunch of packages, but don’t want to return to the hotel just yet). Eventually, of course, guests do have to get themselves back to their hotel room. On their own. With the proximity to the mall, the Radisson Blu has also put in room safety precautions like magnetized card keys–necessary on the elevator for each hotel room floor (no crazed lost shoppers wandering the hallways looking for more stores). The hotel did design part of its beautiful lobby with shoppers in mind, however. For background, a tissue-paper inspired wall is meant to represent a gi-normous shopping bag. Check-in is on this level, but it’s necessary to take the escalator (or elevator if preferred) up to the open Skyway level which overlooks the lobby on three sides and where different elevators to the rooms are located. This is the only part that can be a bit confusing, but staff always seemed nearby to help with directing, if needed. Besides a fitness area, there’s also a small pool within the complex. On the Skyway level (2nd floor) various sitting areas feature modern art type chairs and walls of windows keep it flooded with light. The hotel’s FireLake Grill House and Cocktail Bar are also on this floor. The vibe there is also contemporary and artsy, but warmed up with re-claimed Minnesota barnwood used on the walls. Likewise, the menu combines American heartland flavors with a sophisticated spin. Some of the tastiest dishes were those inspired by Minnesota ingredients: at breakfast the mini pannekoeken (my fave), or wild rice pancakes with lingonberry syrup. At dinner, the house-smoked charcuterie, or pan-fried walleye. For more information, check the hotel website. You can also compare rates at Priceline or Travelocity. Review and photos by Donna Tabbert Long who was a guest of the Radisson Blu.